Tartan is not just a beautiful designer fabric, it also carries history and heritage. The Scottish have historically had the monopoly on linking surnames to Clan or District Tartans - the Irish had some Tartans either connected directly to a few family names, or to districts like Connacht. Now, those of Irish descent can wear a tartan that links them with their heritage. This resource links surnames to suggested tartans the holder may wear - in many cases there are several alternatives, ranging from a family tartan or a district tartan to the newly created County Tartans - all are equally appropriate. Our site enables those of Irish descent who wish to display their heritage the opportunity to identify their eligible tartans and browse garments and fabric available. 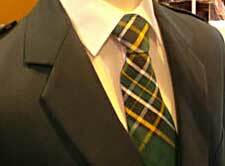 Irish National tartan and a stylish dupion silk tie.